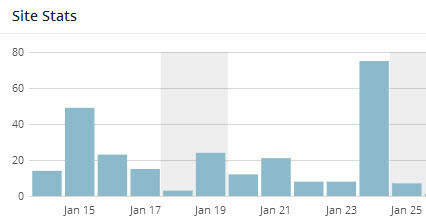 The blog hit a new high on Friday 24th Jan with 75 visitors in one day, I know it’s no Google or BBC but I was very pleased nonetheless. Top search terms were “learn to fly” followed by “Microlight VFR” and then “e-Go”. The user stats have been bouncing around, as can be seen from the graph with a previous high of 66 (not on the graph) when a blog contained the words “engine failure” in the title, just goes to show how people like to read about drama. A couple of people have messaged me to ask why I have not posted an update on my progress (or the lack of it!) for a while well it is quite simply down to the weather, if I don’t fly I tend not to blog. I did go to the fly club this weekend and the two instructors Mike and Katie were there, but no one else. The parking area for the aeroplanes looked like a small lake maybe we should fit floats to the C42s, now there’s an idea!!! I went over as I was due to fly so I had nothing else planned and during the week I had bought myself a David Clark H20-10X headset from a well known online auction house. They were advertised as being in good condition and working, however when I got them they had two issues, the mic boom would not stay in place and the LED light that flashes to say the battery pack is supplying power was not flashing. I emailed the seller who assured me they were working when he last used them and that he had sold them with good intent, going by his tone I believed him and decided to keep them and ask my instructor to take a look at them, before sending them back to the sell if they still didn’t work. Not everyone seems to know this, but if you use “buy it now” as opposed to bidding, even on a second hand item you are covered by the distant trading laws, no matter what the seller may say or put in their listing, they cannot be more restrictive than the rights you have in law. I’m not sure what the case is if you are buy from an overseas seller, but that was not the case for me anyway. After having a little play with them I found the LED would come on if I put pressure on the connection to the battery pack and the mic stayed in place if I push the plastic sleeve back into the hole where it exits the head set. I’m thinking maybe I should write some reviews and then just maybe I would get some free samples!!! Since writing this blog the site has hit a new high of 198 hits in a single day and continues to average in excess of 60 hits per day. It now has over 1,000 followers on Twitter too! So a big thank you to you all and especially those who send me emails complementing the site, it means a lot to me.